You may have heard that omega 3 is good for you and has all kinds of health benefits, but you probably didn’t know that it could save your life. 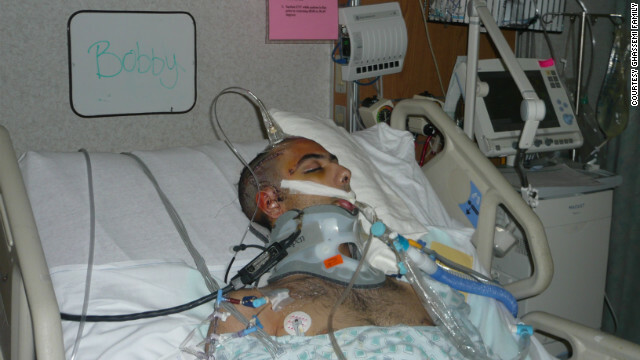 In 2010, 17 year old Bobby Ghassemi was in a terrible auto accident that left him on the brink of death. He suffered from significant trauma to the brain, which was so swollen that a portion of his skull needed to be removed to relieve pressure. Doctors believed it was unlikely that he would ever come out of the coma he was in let alone remember his friends and family. Bobby Ghassemi in critical condition after his car crash. After Bobby stablized, his family heard about an unconventional treatment for brain damage, fish oil. During 2006 a mining accident Randal McCoy had significant damage to his brain form carbon monoxide and methane poisoning. Doctors were successfully able to treat the inflammation to his brain wich incredibly high doses of fish oil. The idea was to allow the brain to heal by giving it plenty of omega 3 fatty acid, one of the primary building blocks of the brain. NIH research suggests that omega 3 can prevent brain cell death and help repair damaged neurons. McCoy’s doctors decided to give him a dose of 20 grams per day of fish oil, more than ten times higher than the 1.5 grams per day that I take. About three weeks later Randal emerged from his coma, and another 3 months after that he was speaking and walking again. Bobby’s father, Peter Ghassemi, fought his doctors to have them try the same treatment for his son that had worked for Randal McCoy. After a long fight Peter prevailed and the doctors began administering the fish oil. Two weeks later there were signs of Bobby emerging from his coma. His hands and legs began moving and after about six weeks Bobby began to remember his family. Bobby still has significant brain damage and he had to relearn how to walk, but he was well enough to attend his high school graduation which was three months after the car crash. Dr. Michael Lewis, founder of the Brain Health Education and Research Institute, believes that Bobby never would have never come out of his coma if he had not received the fish oil treatment. With these two amazing coma recoveries, more research needs to be done looking into the healing power of omega 3 on brain damage victims. There seems to be enormous potential to same a lot of lives. The amazing power of omega 3 to help the brain is not limited to coma patients. Research suggests that a diet high in omega 3 has a positive affect on synapses relating to learning and memory. Studies have shown that kids who take omega 3 do better in school especially in reading and spelling. They are also less likely to have behavioral problems and suffer from ADHD. So don’t wait any longer and start taking omega 3 today. wow what an incredible story. I’m so glad Bobby is ok. I need to go home and take my fish oil pills now! I started eating a nearly paleo diet months ago and continued to take fish oil until a few weeks ago when I started taking fermented cod liver oil instead. You’re no doubt aware of the reputation FCLO has in the traditional/ancestoral food community. Now I’m starting to wonder whether I should start back on the regular fish oil in order to get more EPA/DHA. What do you think? Fermented cod liver oil is a great source of EPA/DHA. I think you can go either way and you will be fine. The benefit of FCLO is that it has vitamin A and D in addition to omega 3. Thanks. I couldn’t find any sources that said whether regular fish oil in addition to the FCLO was beneficial or redundant. Guess I’ll continue with just the FCLO/BO blend and see how I feel after a couple months.